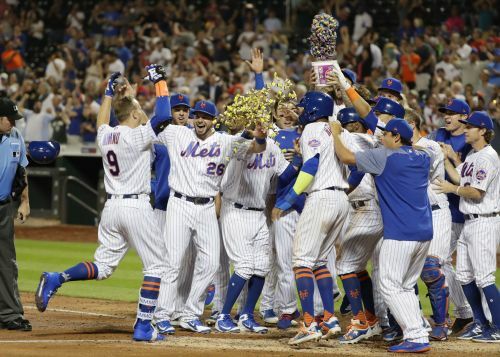 NEW YORK (AP) — Brandon Nimmo's last walk-off home run came with Triple-A Las Vegas to end a 12-inning game in 2016. But current teammate Jay Bruce told him it only counts if you do it in the big leagues. Nimmo launched a pinch-hit, three-run homer in the bottom of the 10th inning and the New York Mets got another dominant outing from All-Star Jacob deGrom in a 3-0 victory over the Philadelphia Phillies on Wednesday night. It was New York's third game-ending homer in the last six days. Jose Bautista beat Tampa Bay with a grand slam last Friday, and Mets walk-off record-holder Wilmer Flores connected Monday in the series opener against the Phillies. "I just kind of blacked out, swung, closed my eyes and it just kind of worked out," Nimmo said with a huge grin. "Now I know how Flo feels all the time. Just trying to be like him." Amed Rosario, who had two of New York's four hits, began the winning rally with a two-out double off Mark Leiter Jr. (0-1) — the first hit for the Mets since the fourth inning. Jose Reyes walked and Nimmo drove Leiter's next pitch well over the wall in right-center for his first career walk-off RBIs. Before his big home run, Nimmo was in a 6-for-46 slump with 20 strikeouts during that stretch. Beaming as he rounded the bases, he was pelted in the face with a bucket of bubble gum by excited teammates as they waited to swarm him at home plate. "You're just floating," Nimmo said. "All the hairs on the back of your neck are standing up. I was just extremely elated." New York won for only the fifth time in its past 24 home games. The Mets earned a four-game split but have gone 15 consecutive series without winning one since sweeping a three-game set against Arizona from May 18-20. Philadelphia dropped back into a first-place tie with Atlanta in the NL East. In his final scheduled start before heading to the All-Star Game next Tuesday in Washington, deGrom scattered five hits over eight innings and matched his longest outing of the season. He struck out seven and lowered his major league-leading ERA to 1.68, tied with Dwight Gooden (1985) for the best by a Mets starter before the All-Star break. "He should be starting the All-Star Game," New York manager Mickey Callaway said. "There's no doubt in my mind. If he's not, then that's the wrong decision. That would be the bow for me." Despite all his success, deGrom has only five wins this season. The right-hander has consistently been hurt by poor run support from an anemic New York lineup. "I think the most impressive part is his ability to not worry about the lack of offense behind him," Callaway said. "Most people can't just sit there and weather the storm like that." This time, at least, the Mets didn't let deGrom's gem go to waste. Phillies starter Vince Velasquez returned from the disabled list and matched deGrom, allowing two hits over six scoreless innings. The right-hander missed only one start after being hit just below the right elbow by a line drive on June 30. "Super tough loss," Philadelphia manager Gabe Kapler said. "(Velasquez) went toe-to-toe with one of the best pitchers in baseball. He did as good of a job as we could have possibly asked of him coming off 10 days down, really giving us everything he had." The Phillies had a threat mounting in the 10th, but catcher Andrew Knapp was thrown out attempting to move from first to third on Cesar Hernandez's infield single. "We teach aggressiveness," Kapler said. "He made an aggressive play and I stand behind it." Longtime New York Mets radio broadcast engineer Chris Majkowski threw out the ceremonial first pitch. A 25-year veteran, "Maj" has not missed a game since Aug. 8, 1993 — a string of 4,011 consecutive games. Phillies: RHP Luis Garcia (right wrist strain) will pitch for Triple-A Lehigh Valley on Friday and Sunday and then will be re-evaluated. ... OF Rhys Hoskins went through concussion protocol after crashing into the left-field wall Tuesday, but was cleared and was in the starting lineup. He went 0 for 3 with a walk. Mets: 2B Asdrubal Cabrera (left elbow) was held out of the starting lineup after aggravating a previously hyperextended elbow. He drew an intentional walk as a pinch-hitter in the eighth. ... RHP Noah Syndergaard (finger) threw a successful bullpen and "felt great," according to Callaway. Syndergaard is expected to come off the disabled list to start Friday against Washington. He has not pitched in the majors since May 25. ... OF Yoenis Cespedes (right hip flexor strain) is still unable to fully run the bases. The ailing slugger is only able to run straight ahead, and a start date for a rehab stint remains unclear. ... LHP Jason Vargas (strained right calf) will make another rehab start with Class A Brooklyn on Saturday. Callaway indicated the team would like to see Vargas' pitch count reach 90 before he is activated. Phillies: RHP Nick Pivetta (5-7, 4.62 ERA) opposes RHP Kevin Gausman (4-6, 4.11) when Philadelphia visits Baltimore on Thursday night to make up a May 15 postponement. Pivetta has struggled in his last two starts, allowing eight earned runs in 4 1/3 innings. Mets: LHP Steven Matz (4-6, 3.31 ERA) takes on All-Star Max Scherzer (11-5, 2.33) as New York welcomes Washington to Citi Field to open a four-game series Thursday. Matz has allowed just one earned run over his last two starts and opponents are hitless in their last 26 at-bats against him with runners on.